Ohio authorities released unnerving 911 calls Saturday that were placed from two of the four homes where eight family members were found dead a day prior. "There's blood all over the house! My brother-in-law's in the bedroom. It looks like someone has beat the hell out of him," a female caller who identifies herself as Bobbi breathlessly says in the first call. "There's blood all over the covers." 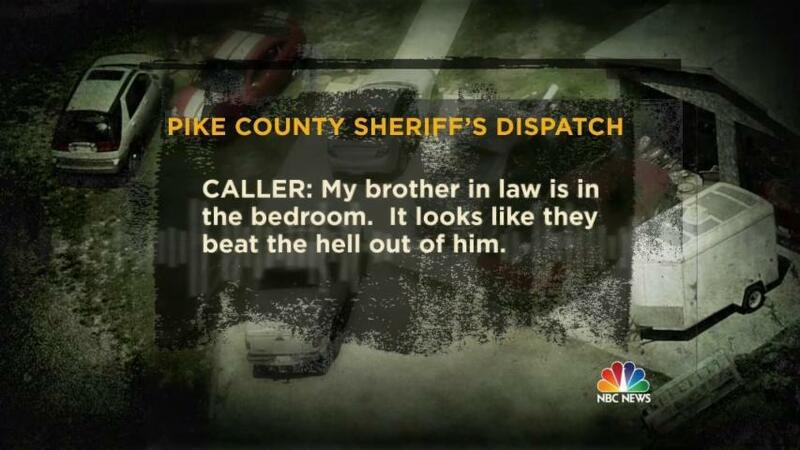 Officials still have no one in custody in the killings, which happened in Piketon, a rural town east of Cincinnati. The manhunt intensified Saturday for a killer or killers after police interviewed 30 people overnight but made no arrests. The victims were all members of the Rhoden family, police said Friday. Seven were adults, the eighth was a 16-year-old boy. None died by suicide, authorities added. The victims were identified Saturday as: Hannah Gilley, 20; Christopher Rhoden, Sr., 40; Christopher Rhoden, Jr., 16; Clarence "Frankie" Rhoden, 20; Dana Rhoden, 37; Gary Rhoden, 38; Hanna Rhoden, 19; and Kenneth Rhoden, 44. Ohio Attorney General Mike DeWine said Saturday that work at the four crime scenes has been completed. One victim was a young mom, murdered in bed as she lay with her 4-day-old newborn; the baby, plus two other children, escaped the slaughter. The first call was placed at 7:49 a.m., according to the audio, which was released by DeWine and Pike County Sheriff Charles Reader. The caller tells the 911 dispatcher she arrived to find the home locked, but knew where the key was, so she let herself in. Once inside, she saw her brother-in-law and another man "laying on the floor." "I think they're both dead. Looks like someone has beat the (expletive) out of them," she said. The call is punctuated by her stopping to catch her breath and crying. The next call was placed at 1:26 p.m. at a different location from a man who identified himself as Kenneth Rhoden. "It's all that stuff that's on the news," he says. "I just found my cousin with a gunshot wound." When asked whether his cousin is alive, he responds, "No. No." The first call lasted nearly two-and-a-half minutes. The second was under a minute and 40 seconds. The sheriff said "a specific family that has been targeted." Jeff Ruby, a Cincinnati-area restaurant owner, put up a $25,000 reward on Saturday for any information leading to an arrest, DeWine said. On Friday, DeWine said there could be multiple suspects. "There may be one, there may be two, there may be three, we just don't know," he said. "We're very early in this investigation." Other than the 4-day-old, a 6-month-old and a 3-year-old survived. On Saturday, a woman speaking on behalf of the Rhoden family thanked investigators and said the family had asked for prayers and for anyone with information to contact the state bureau of investigation. Piketon, which has a population of about 2,200, is about 95 miles east of Cincinnati.